Last week, Dorchester County, SC decided to combat mosquitoes with an aerial application of pesticide. One apiary alone lost 46 hives in just a few hours. To an outsider, that may look like an equable loss, given the severe impacts of the Zika virus, but to a beekeeper it represents the loss of years of hard work and the likely loss of income until next spring when they can start their business from scratch. The pesticide didn’t just kill the bees that were foraging — it killed the bees and the larvae in the hives. Total destruction. Any honey in the hives is also non-marketable now that it is contaminated with pesticides. On a smaller scale, we are dealing with the same problem at our house in the city. Our neighbor has her yard sprayed monthly as her son is very allergic to mosquito bites. That is her right. However, the EPA requires that citizens be notified in advance before toxic chemicals that can drift from one yard to another are sprayed in the air. The EPA also requires that pesticide companies ensure their products do not drift from the intended application site to other people’s properties. After calling the company, we now sometimes get a phone call 30 minutes before the technician arrives, during the day, while we are at work. But not this past weekend. A phone call or email the day before would allow us to protect our bees and honey. In addition, the company told us that the spray was not toxic to bees, and left no residue. Wrong and wrong again. The chemical they are using, CYZMIC CS, is highly toxic to bees, is a skin and respiratory-tract irritant for humans and remains on any flowers it comes into contact with. 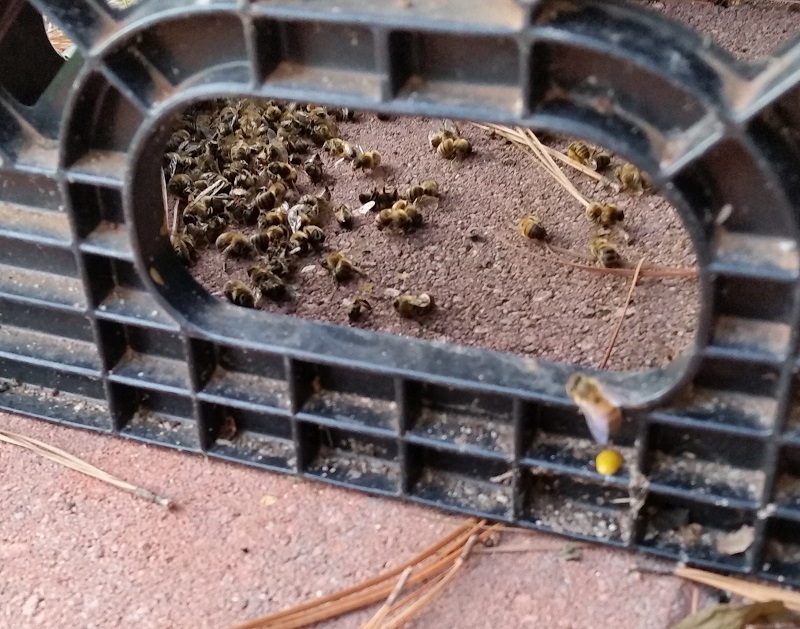 When we returned from Labor Day weekend at the farm, the ground around one of our Nuc splits was littered with dead bees and, on opening the hive, we found a 75% bee loss. Over the next few days, more bees died and the surviving bees pulled the contaminated larvae out of the frames. The state regulatory investigator from Clemson University confirmed that the hive loss was a result of pesticide application. They took the hive with them so that they can try to determine which pesticide was used, and we are waiting to hear back. Even if they had not taken the hive, we would have had to destroy it as the chemicals are clearly ingrained in the wood and frames. 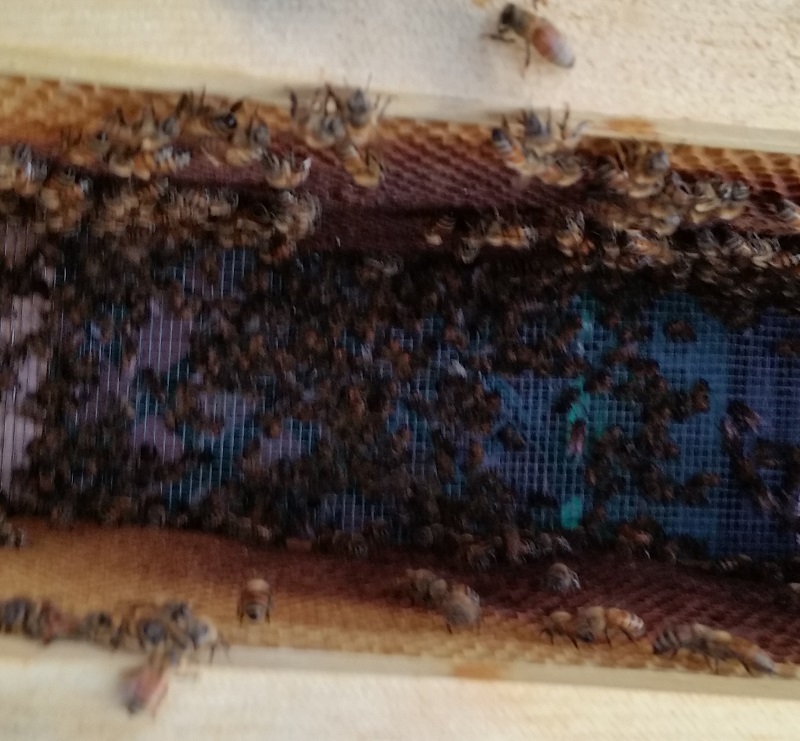 The second Nuc from our recent split has less damage, and we are hoping the queen cell and larvae in there are viable. UPDATE: January 2017 — Clemson University confirmed that the bee loss was due to pesticide application, and we lost the second Nuc. The mosquito-spray company was not responsible, but a neighbor told us that she saw someone go into our backyard Labor Day weekend, so it seems like someone intentionally killed our bees. We have heard of that happening to other bee keepers, and that is the main reason we have moved most of our hives to the country. What to do? It is possible to kill mosquitoes while minimizing bee loss by administering chemicals very early morning before the bees are out and about. There will still be some bee loss, but not total destruction of colonies. Informing beekeepers in advance gives them time to trap the bees in the hive at night and keep them “indoors” until it’s relatively safe. Even giving beekeepers enough advance warning to let them throw sheets over hives is better than nothing. Beekeepers also have to be proactive. Register your apiary’s! In South Carolina this is done through Clemson University. Companies that administer pesticides are required to review the database of apiary locations before applying chemicals that can harm bees. Beekeepers also need to report losses to the EPA. The Honey Bee Health Coalition has a wonderful incident reporting guide. It won’t get the bees back, but it may reduce future losses. We got into this business when we figured out that no bees = no tomatoes + no zucchini in our garden. And that’s just the tip of the pollination iceberg. There’s more at stake here than some annoying insects that sting. The good news (let’s end this on a positive note) is that the master beekeeper who investigated our hives as part of the regulatory team said that our other hives are very healthy and clearly well maintained. He told hubby that we should keep doing what we are doing because it is clearly working. It was good to have our apiary practices classified as professional and to hear that the bee loss was in no way-shape-or-from a result of anything that we could have done or prevented.